After a Reddit thread started up that briefly referenced a 2011 post I wrote about adding IPv6 to Node.js apps, I was contacted by a Redditor who was surprised that my site wasn’t available over IPv6! 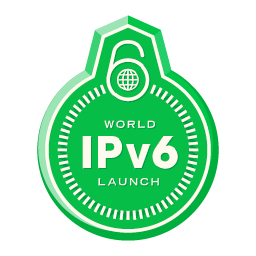 I was surprised, too, because this site is hosted on a dual-stack server at Hurricane Electric and has been accessible over IPv6 since June 7, 2011, right before the World IPv6 Day event. But in checking into it… there was no AAAA record in DNS for “code.danyork.com” that would point to the server, so the report was indeed accurate. 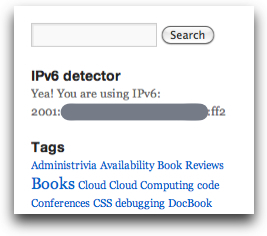 For regular users this site was not available over IPv6. It turned out to be one of those system administration issues that can bite you. A month or two ago, TypePad, the provider I still use for my personal DanYork.com site, experienced a severe DDoS attack that took many sites offline. They recovered but in doing so changed the way that sites were referenced a bit. I had to switch to using a CNAME instead of an IP address as I had been doing. The problem there is that due to the “no CNAME at zone apex” rule of DNS, I could no longer use just “http://danyork.com” – I would have to switch to using “http://www.danyork.com/”. The episode highlighted to me, though, the need to be sure I have “Test over IPv6” in my list of things to check after making any major changes to any of my sites! I didn’t want to switch and so I moved the DNS for “danyork.com” over to CloudFlare to make use of their “CNAME Flattening” so that I could still use “danyork.com”. However, in moving the DNS info from my previous DNS hosting provider to CloudFlare, I messed up. I didn’t bring across the AAAA record for code.danyork.com. Also, very bizarrely, I didn’t have the “Automatic IPv6” setting enabled for danyork.com – even though it is now supposed to be on by default for all new domains. So the fix was simple – I added the AAAA record for code.danyork.com, and I also flipped the switch on the Automatic IPv6 gateway. Now both code.danyork.com and danyork.com are fully available over IPv6. 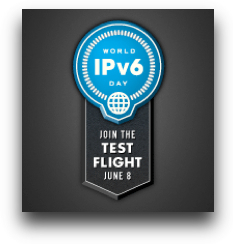 This entry was posted in Administrivia and tagged IPv6 on July 28, 2014 by Dan York. Tonight I just upgraded Code.DanYork.com to the shiny new WordPress 3.1… it’s the first of several sites I’ll be upgrading so this is mostly a test. If you see anything funky, please do let me know…. and, man, I keep loving what the WordPress community keeps on developing! Cool stuff! This entry was posted in Administrivia on February 23, 2011 by Dan York. This server has received 5726835 hits from both ipv4 and ipv6.